Living in Anguilla is not impossible. One of the least complicated steps? 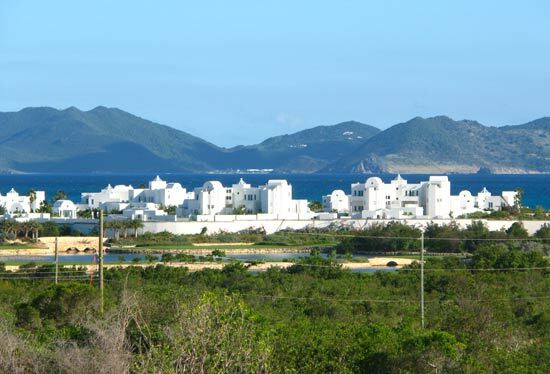 Finding cheap Anguilla villa rental options isn't as hard as it may seem on an island largely targeted to the rich and famous. 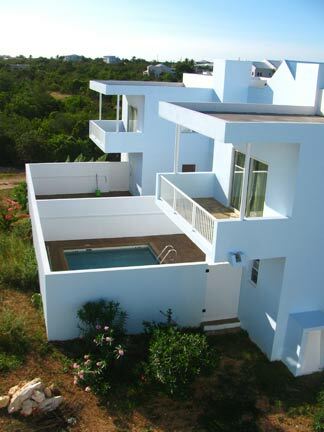 There are many Anguilla apartments and low cost Anguilla villas for rent. The only challenge? Getting more than your money's worth. 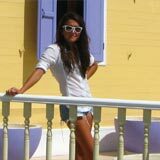 Remember our favorite Anguilla artist, Cheddie Richardson? He has steadily expanded his business. From his art gallery, to his souvenir shop, to his mouthwatering Anguilla restaurant. Now, his entrepreneurial spirit has been sparked again! In typical Cheddie fashion (he is an artist after all! 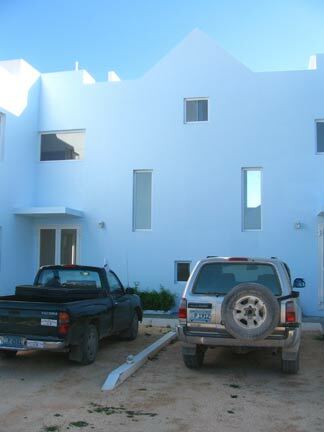 ), this Anguilla villa rental is aesthetically pleasing. 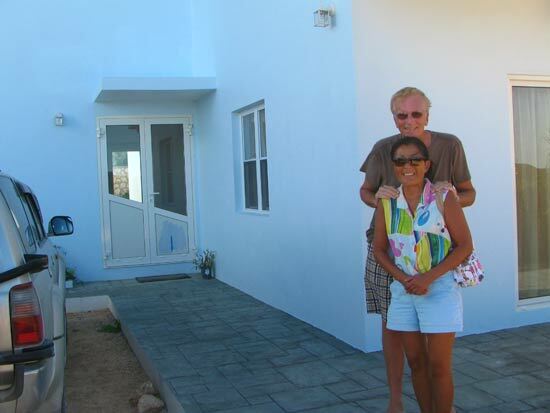 Newly built and furnished, these villas are "modern" in feel and utility. It is evident from the exterior design, before even walking inside! It continues throughout the 2 floors and basement. Cheddie has kept the driveway simple with a dirt driveway. Around the entrance, on either sides of the buildings, you will find lush gardens. 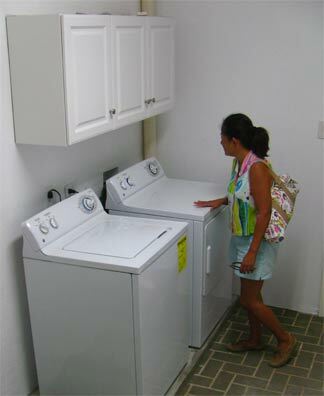 The basement serves as a mud room complete with a washer and dryer. See how excited my Mom is? She just loves to do laundry! 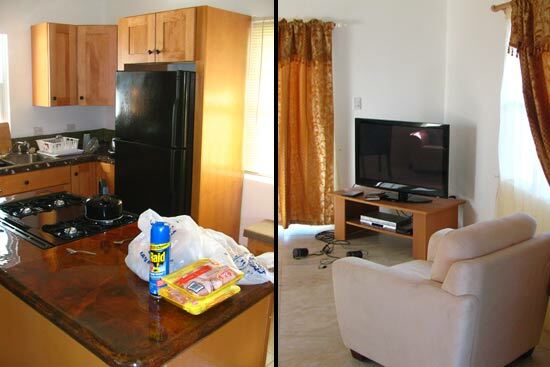 The main floor features the kitchen and dining area, along with the living room with flat screen TV. Internet, too! Oh yes, and a bathroom. The two bedrooms, each with its own balcony, bathroom and air conditioning, are on the second floor. Cheddie led the tour, proudly showing off his brand new villa. He started with the attractive modern kitchen, complete with brand new dishes, stove, fridge, microwave and a dishwasher. The nicely built cupboards and countertops are a cut above what you would normally find in an Anguilla villa rental in this price bracket. The living space is big, bright, breezy, and has high ceilings! 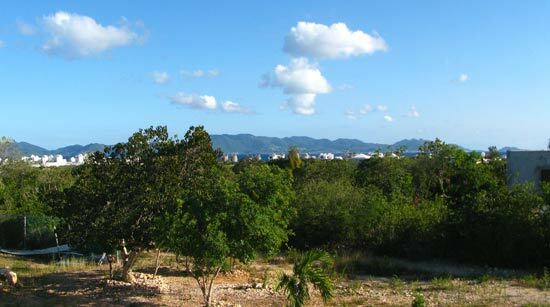 Many inland Anguilla villa rentals can be stifling hot because they are away from the cooling tradewinds. It's common for windows to be small (for North American tastes). Cheddie's villas are at an elevation that receives a nice breeze, so have a cool airiness to them. Large windows and sliding doors give good interior light and a fresh feeling. A lot of living chez Cheddie takes place outside. 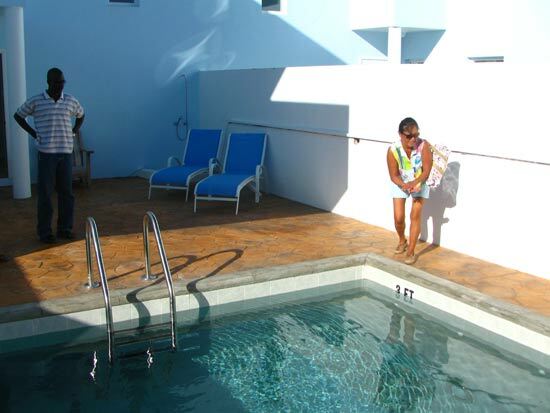 With a comfortable deck and your own private 12x12 "plunge" pool, why stay inside all day? The Mexican inspired tiles are my favorite, along with the vines that climb the stone wall (in the photo below). Cheddie also supplies comfortable chaises and some pool toys, too! Each deck has an outdoor shower. The bedrooms are sizable, complete with modern furnishings and their own bathrooms. A modern feel resonates throughout. The bed's headboard demonstrates flawless woodwork! 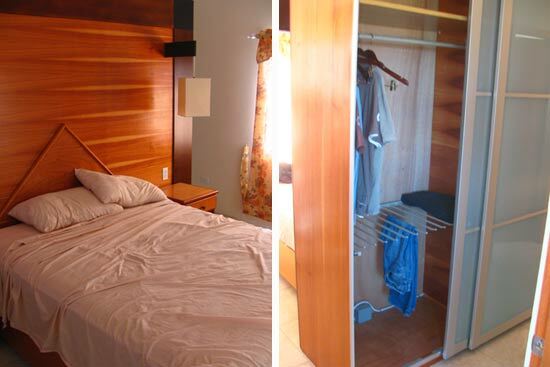 It also doubles as a closet with storage space for clothes. Finally... my Dad's favorite part of Cheddie's villas? Panoramic views! 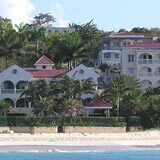 For an extremely reasonable rental rate, Cheddie's Anguilla villa rentals are one of the best deals to be had on Anguilla. Mike, our trusty Anguilla home builder, recently scoured the entire island for a villa to rent (noisy construction had started nearby). Mike knows his stuff when it comes to evaluating construction. After combing the island, Mike is now living in one of Cheddie's units with his wife and son. Cheddie is a good friend of our family, but that's not why I recommend them. This just may be the best value for the long term villa renter.